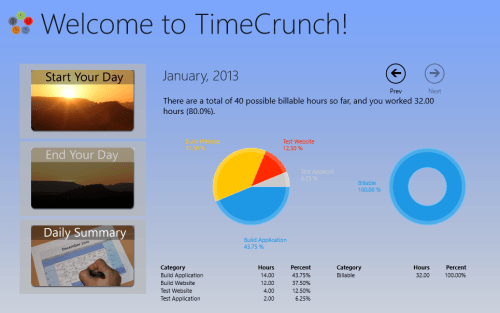 TimeCrunch is a free Windows 8 time management app. It helps you in keeping track of your time and suits best for professionals who deliver their services on hourly basis. 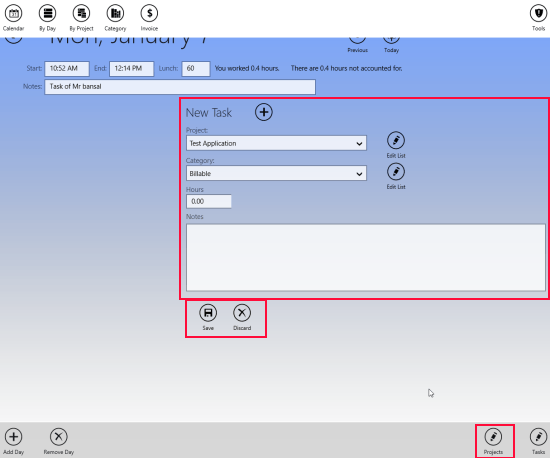 In addition, there exists a scope for utilizing TimeCrunch as a personal time management app for Windows 8. Using this time management Windows 8 app, you can easily bill your time devoted to jobs by multiple providers. So, if you have such requirement then TimeCrunch is perhaps the best App for your Windows 8 machine. The following section contains an overview of this app, its pros & cons, and related how-tos. On launching TimeCrunch Windows 8 Time Management App for first time, you will be prompted with pre-populating the interface with default entries or to reset and start from scratch. If you are new and unfamiliar about the interface then click on ‘Load Some Sample Data’ instead of ‘Set up My Profile’ button after agreeing with the terms and conditions. Then, you will be taken to the dashboard from where you can move on with management process. Have a look on the screenshot below. Click on ‘Start Your Day’ button to mark the beginning of you’re your day. Next, you will be presented an easy form for entering details. There you can create new tasks and associate them with an existing project. 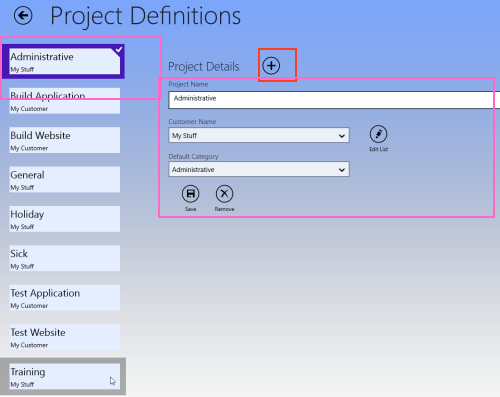 In case the project is not defined then click on ‘Projects’ button placed on the bottom-right section of the interface. Finally, click on ‘save’ button. Then, on following interface you can add a new project or edit the existing one. To add a new project click on ‘+’ button placed in the center region. For modifying project details, you will require selecting the particular project from left and then overwrite its details. You generate a report with your day-to-day summaries; summaries on weekly and yearly basic can also be generated. In other words you can easily some to know about the number of hours you’ve worked in a particular week or month. * It will be a nice idea to create your projects before feeding tasks. * For report generation you will have to go to the home screen, then right-click on the blank section, and select appropriate option from horizontal panel at top. Also, check out our posts on Expense Tracker Apps, Password Generator Apps, and Financial Planner App. To install, TimeCrunch Windows 8 time management app you will require opening this link in supported Web browser. Then click on ‘View in Windows Store’ button followed by a click on ‘Install’ button on app overview window. TimeCrunch offers you the easiest way to feed time at the end of the day and do the calculations for billing your time and generate reports.